Rōmaji (ローマ字) was developed to describe the sound of Japanese in Roman alphabet. Rōmaji is mainly used for the convenience of foreigners who are not familiar with Japanese characters. For example, names of train stations are shown in both Rōmaji (Roman alphabet) and Japanese characters. We believe this is the most complete and suitable system for the Japanese language education. The following tables show the Rōmaji spelling of Kana letters (Hiragana and Katakana). Irregular spellings are colored in red. The purpose of the apostrophe is to distinguish はんい (han'i) and はに (hani), しんや (shin'ya) and しにゃ (shinya). Make the following consonant letter double. Basically, you can read Rōmaji as you usually read English texts. But the pronunciation of Japanese syllables is not exactly the same as English. To master the correct pronunciation, try to imitate the pronunciation of native Japanese speakers. Each syllable (each Hiragana and Katakana letter) is pronounced for the same length. For example, when you say the word [aka] in 1 second, it takes 0.5 second for [a] and another 0.5 second for [ka]. You don't have to be this precise, but it is important to keep it mind. Letters with a bar on top - ā, ū, ē and ō are long vowels and the length should be double of the standard vowels. [f] sound: Create the sound with pursed lips (like whistling). [r] sound: Tip of your tongue is rolled back for English [r], and is placed behind the upper teeth for English [l]. For Japanese [r], the position is between these two. The sound is more closer to English [l]. [n] sound: It is considered to be one syllable, and the length should be the same as other syllables. You can learn and practice the pronunciation at Hiragana Course. The story is about the Dark Lord who was forced to escape to Tokyo. He starts to work at a fast food restaurant for survival and encounters his old enemy who works as a call center operator. 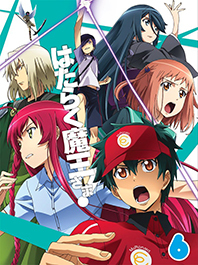 The filming site of this animation is near Shinjuku, Tokyo. 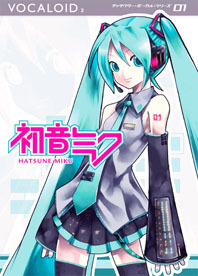 初音ミク is a virtual singer who can sing any song that anybody composes. You just input lyrics and melody on your PC. Then she will start singing your original song. This VOCALOID (vocal android) technology developed by YAMAHA made a massive impact on amateur creators and inspired them to publish their original works on the web.